In a dark, dusty patch of sky in the constellation Sagittarius, a small star, known as S2 or, sometimes, S0-2, cruises on the edge of eternity. Every 16 years, it passes within a cosmic whisker of a mysterious dark object that weighs some 4 million suns, and that occupies the exact center of the Milky Way galaxy. For the last two decades, two rival teams of astronomers, looking to test some of Albert Einstein’s weirdest predictions about the universe, have aimed their telescopes at the star, which lies 26,000 light-years away. In the process, they hope to confirm the existence of what astronomers strongly suspect lies just beyond: a monstrous black hole, an eater of stars and shaper of galaxies. For several months this year, the star streaked through its closest approach to the galactic center, producing new insights into the behavior of gravity in extreme environments, and offering clues to the nature of the invisible beast in the Milky Way’s basement. One of those teams, an international collaboration based in Germany and Chile, and led by Reinhard Genzel, of the Max Planck Institute for Extraterrestrial Physics, say they have found the strongest evidence yet that the dark entity is a supermassive black hole, the bottomless grave of 4.14 million suns. The evidence comes in the form of knots of gas that appear to orbit the galactic center. Dr. Genzel’s team found that the gas clouds circle every 45 minutes or so, completing a circuit of 150 million miles at roughly 30 percent of the speed of light. They are so close to the alleged black hole that if they were any closer they would fall in, according to classical Einsteinian physics. Astrophysicists can’t imagine anything but a black hole that could be so massive, yet fit within such a tiny orbit. The results provide “strong support” that the dark thing in Sagittarius “is indeed a massive black hole,” Dr. Genzel’s group writes in a paper that will be published on Wednesday under the name of Gravity Collaboration, in the European journal Astronomy & Astrophysics. “This is the closest yet we have come to see the immediate zone around a supermassive black hole with direct, spatially resolved techniques,” Dr. Genzel said in an email. Reinhard Genzel runs the Max Planck Institute for Extraterrestrial Physics in Munich. He has been watching S2, in the constellation Sagittarius, hoping it will help confirm the existence of a supermassive black hole.Credit Ksenia Kuleshova for The New York Times. The work goes a long way toward demonstrating what astronomers have long believed, but are still at pains to prove rigorously: that a supermassive black hole lurks in the heart not only of the Milky Way, but of many observable galaxies. The hub of the stellar carousel is a place where space and time end, and into which stars can disappear forever. The new data also help to explain how such black holes can wreak havoc of a kind that is visible from across the universe. Astronomers have long observed spectacular quasars and violent jets of energy, thousands of light-years long, erupting from the centers of galaxies. Roger Blandford, the director of the Kavli Institute for Particle Astrophysics and Cosmology at Stanford University, said that there is now overwhelming evidence that supermassive black holes are powering such phenomena. Images of different galaxies — some of which have evocative names like the Black Eye Galaxy, bottom left, or the Sombrero Galaxy, second left — adorn a wall at the Max Planck Institute.Credit Ksenia Kuleshova for The New York Times. Sheperd Doeleman, a radio astronomer at the Harvard-Smithsonian Center for Astrophysics, called the work “a tour de force.” Dr. Doeleman studies the galactic center and hopes to produce an actual image of the black hole, using a planet-size instrument called the Event Horizon Telescope. The study is also a major triumph for the European Southern Observatory, a multinational consortium with headquarters in Munich and observatories in Chile, which had made the study of S2 and the galactic black hole a major priority. The organization’s facilities include the Very Large Telescope [shown above], an array of four giant telescopes in Chile’s Atacama Desert (a futuristic setting featured in the James Bond film “Quantum of Solace”), and the world’s largest telescope, the Extremely Large Telescope, now under construction on a mountain nearby. Black holes — objects so dense that not even light can escape them — are a surprise consequence of Einstein’s general theory of relativity, which ascribes the phenomenon we call gravity to a warping of the geometry of space and time. When too much matter or energy are concentrated in one place, according to the theory, space-time can jiggle, time can slow and matter can shrink and vanish into those cosmic sinkholes. Einstein didn’t like the idea of black holes, but the consensus today is that the universe is speckled with them. Many are the remains of dead stars; others are gigantic, with the masses of millions to billions of suns. Such massive objects seem to anchor the centers of virtually every galaxy, including our own. Presumably they are black holes, but astronomers are eager to know whether these entities fit the prescription given by Einstein’s theory. Although general relativity has been the law of the cosmos ever since Einstein devised it, most theorists think it eventually will have to be modified to explain various mysteries, such as what happens at the center of a black hole or at the beginning of time; why galaxies clump together, thanks to unidentified stuff called dark matter; and how, simultaneously, a force called dark energy is pushing these clumps of galaxies apart. The existence of smaller black holes was affirmed two years ago, when the Laser Interferometer Gravitational-Wave Observatory, or LIGO, detected ripples in space-time caused by the collision of a pair of black holes located a billion light-years away. But those black holes were only 20 and 30 times the mass of the sun; how supermassive black holes behave is the subject of much curiosity among astronomers. “We already know Einstein’s theory of gravity is fraying around the edges,” said Andrea Ghez, a professor at the University of California, Los Angeles. “What better places to look for discrepancies in it than a supermassive black hole?” Dr. Ghez is the leader of a separate team that, like Dr. Genzel’s, is probing the galactic center. “What I like about the galactic center is that you get to see extreme astrophysics,” she said. Despite their name, supermassive black holes are among the most luminous objects in the universe. As matter crashes down into them, stupendous amounts of energy should be released, enough to produce quasars, the faint radio beacons from distant space that have dazzled and baffled astronomers since the early 1960s. Astronomers have long suspected that something similar could be happening at the center of the Milky Way, which is marked by a dim source of radio noise called Sagittarius A* (pronounced Sagittarius A-star). But the galactic center is veiled by dust, making it all but invisible to traditional astronomical ways of seeing. Reinhard Genzel grew up in Freiburg, Germany, a small city in the Black Forest. As a young man, he was one of the best javelin throwers in Germany, even training with the national team for the 1972 Munich Olympics. Now he is throwing deeper. He became interested in the dark doings of the galactic center back in the 1980s, as a postdoctoral fellow at the University of California, Berkeley, under physicist Charles Townes, a Nobel laureate and an inventor of lasers. “I think of myself as a younger son of his,” Dr. Genzel said in a recent phone conversation. In a series of pioneering observations in the early 1980s, using detectors that can see infrared radiation, or heat, through galactic dust, Dr. Townes, Dr. Genzel and their colleagues found that gas clouds were zipping around the center of the Milky Way so fast that the gravitational pull of about 4 million suns would be needed to keep it in orbit. But whatever was there, it emitted no starlight. Even the best telescopes, from 26,000 light years away, could make out no more than a blur. Part of ESO’s Paranal Observatory, the VLT Survey Telescope (VISTA) observes the brilliantly clear skies above the Atacama Desert of Chile. It is the largest survey telescope in the world in visible light. These keen eyes revealed hundreds of stars in the galaxy’s blurry core, all buzzing around in a circle about a tenth of a light year across. One of the stars, which Dr. Genzel calls S2 and Dr. Ghez calls S-02, is a young blue star that follows a very elongated orbit and passes within just 11 billion miles of the mouth of the putative black hole every 16 years. During these fraught passages, the star, yanked around an egg-shaped orbit at speeds of up to 5,000 miles per second, should experience the full strangeness of the universe according to Einstein. Intense gravity on the star’s surface should slow the vibration of light waves, stretching them and making the star appear redder than normal from Earth. This gravitational redshift, as it is known, was one of the first predictions of Einstein’s theory. The discovery of S2 offered astronomers a chance to observe the phenomenon in the wild — within the grip of gravity gone mad, near a supermassive black hole. To conduct that experiment, astronomers needed to know the star’s orbit to a high precision, which in turn required two decades of observations with the most powerful telescopes on Earth. “You need twenty years of data just to get a seat at this table,” said Dr. Ghez, who joined the fray in 1995. And so, the race into the dark was joined on two different continents. 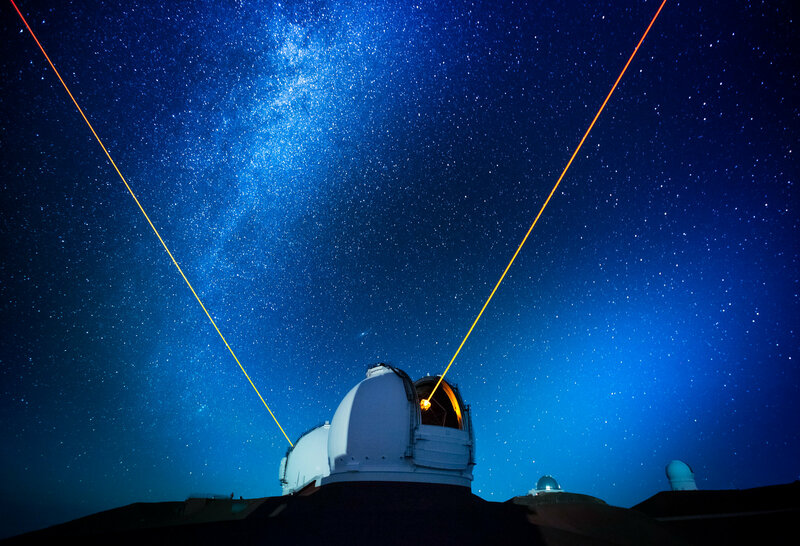 Dr. Ghez worked with the 10-meter Keck telescopes, located on Mauna Kea, on Hawaii’s Big Island. Dr. Genzel’s group benefited from the completion of the European Southern Observatory’s brand new Very Large Telescope [above] array in Chile. The European team was aided further by a new device, an interferometer named Gravity, that combined the light from the array’s four telescopes. “All of the sudden, we can see 1,000 times fainter than before,” said Dr. Genzel in 2016, when the instrument went into operation. In addition, they could track the movements of the star S2 from day to day. Meanwhile, Dr. Ghez was analyzing the changing spectra of light from the star, to determine changes in the star’s velocity. The two teams leapfrogged each other, enlisting bigger and more sophisticated telescopes, and nailing down the characteristics of S2. In 2012 Dr. Genzel and Dr. Ghez shared the Crafoord Prize in astronomy, an award nearly as prestigious as the Nobel. Events came to head this spring and summer, during a six-month period when S2 made its closest approach to the black hole. “It was exciting in the middle of April when a signal emerged and we started getting information,” Dr. Ghez said. On July 26, Dr. Genzel and Dr. Eisenhauer held a news conference in Munich to announce that they had measured the long-sought gravitational redshift. As Dr. Eisenhauer marked off their measurements, which matched a curve of expected results, the room burst into applause. “The road is wide open to black hole physics,” Dr. Eisenhauer proclaimed. In early October, Dr. Ghez, who had waited to observe one more phase of the star’s trip, said her team soon would publish their own results. The big break came when his team detected evidence of hot spots, or “flares,” in the tiny blur of heat marking the location of the suspected black hole. A black hole with the mass of 4 million suns should have a mouth, or event horizon, about 16 million miles across — too small for even the Gravity instrument to resolve from Earth. The hot spots were also too small to make out. But they rendered the central blur lopsided, with more heat on one side of the blur than the other. As a result, Dr. Genzel’s team saw the center of that blur of energy shift, or wobble, relative to the position of S2, as the hot spot went around it. The star has finished its show for this year. Dr. Genzel hopes to gather more data from the star next year, as it orbits more distantly from the black hole. Additional observations in the coming years may clarify the star’s orbit, and perhaps answer other questions, such as whether the black hole was spinning, dragging space-time with it like dough in a mixer. 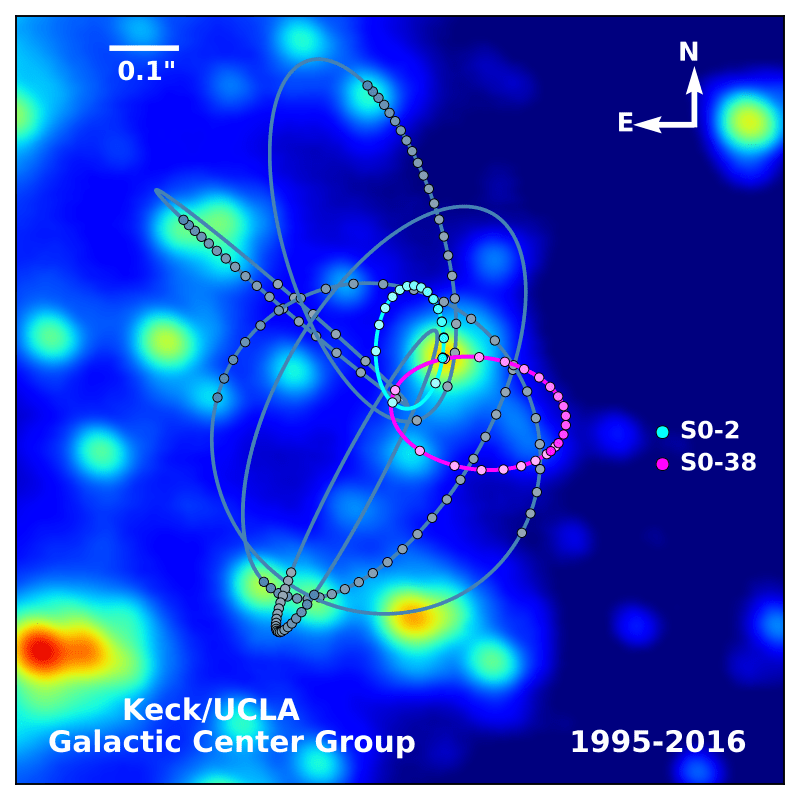 Tags: Andrea Ghez/Keck Observatory/UCLA Galactic Center Group, Astronomy ( 7,548 ), Astrophysics ( 4,683 ), Basic Research ( 10,441 ), Cosmology ( 4,874 ), EarthSky ( 82 ), Sgr A* ( 12 ), Unseen siblings for Milky Way’s supermassive black hole? Our Milky Way galaxy is known to have a supermassive black hole at its heart. Could more supermassive black holes be lurking unseen at our galaxy’s outskirts? Nowadays, astronomers think that nearly all large galaxies have supermassive black holes at their cores. Our own Milky Way’s central black hole is called Sgr A* (pronounced Sagittarius A-star), and it’s the focus of many fascinating studies. Artist’s concept of the orbit of the star S2 (sometimes S0-2), shown in light blue. In the next few months, this star is expected to plunge near a gigantic black hole in our galaxy. Image via S. Sakai/Andrea Ghez/Keck Observatory/UCLA Galactic Center Group. This week (April 24, 2018), astrophysicists announced the results of a new study based not on observations, but on a state-of-the-art cosmological simulation, called Romulus. The simulation showed that galaxies might contain more than one supermassive black hole. In fact, a galaxy with a mass like that of our Milky Way should host several, these scientists said. The extra supermassive black holes might “wander” throughout a galaxy, remaining far from its center. If it’s true, then could our own Milky Way galaxy’s supermassive black hole have an unseen sibling or two? How did these extra supermassive black holes get into the Milky Way? These scientists – led by Michael Tremmel at Yale – think the sibling black holes, if they exist, indicate mergers between our Milky Way and other galaxies in the early universe. If a smaller galaxy joined ours, it might have deposited its own central supermassive black hole within our galaxy. When the universe was young, this might have happened several times. So, theoretically, multiple supermassive black holes – wandering supermassive black holes – within galaxies are possible. But no one has yet discovered them. Tremmel said that, in the next several decades, gravitational wave telescopes in space should be able to detect the black hole mergers that would cause galaxies to have more than one supermassive black hole. Perhaps this is a normal part of galaxy evolution. An extremely unlikely encounter indeed! Bottom line: Astronomers ran a sophisticated computer simulation called Romulus to learn that galaxies like our Milky Way might contain multiple supermassive black holes. Thus our Milky Way’s central supermassive black hole might have unseen siblings.